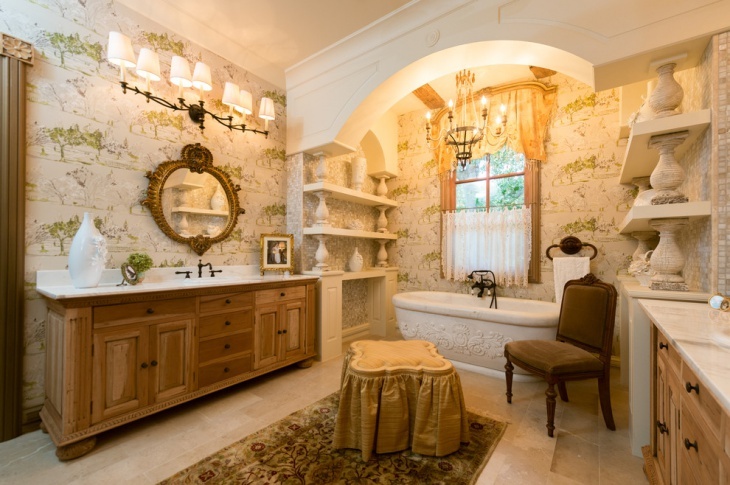 French country style bathrooms are a blend of bold and simple designs incorporated in one to create a significantly charming look which represents the true French country style. These kinds of bathrooms are ideal for those who want to keep their bathroom space elegant and at the same time, subtle. 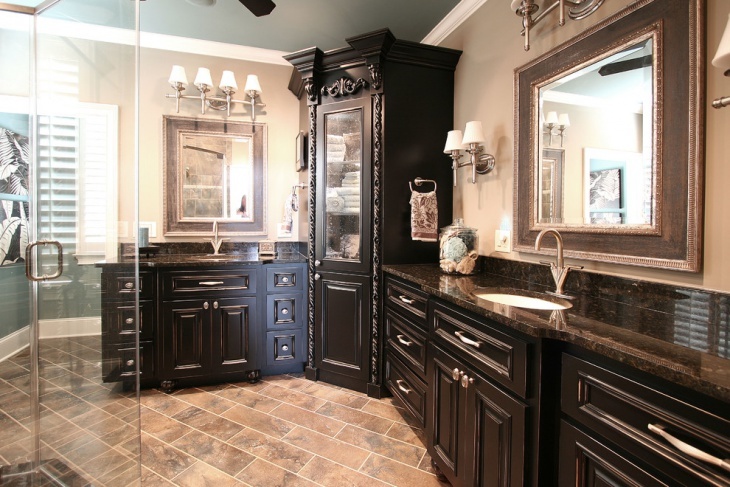 Below are some of the breathtaking French Country Bathroom ideas we have collected for you. This beautiful master bathroom reflects the true French country style, it has a large vanity with wooden cabinets below, a huge mirror and traditional lights hung next to the mirror. It also features curtains in the windows next to the bathtub and a mini chandelier just above. 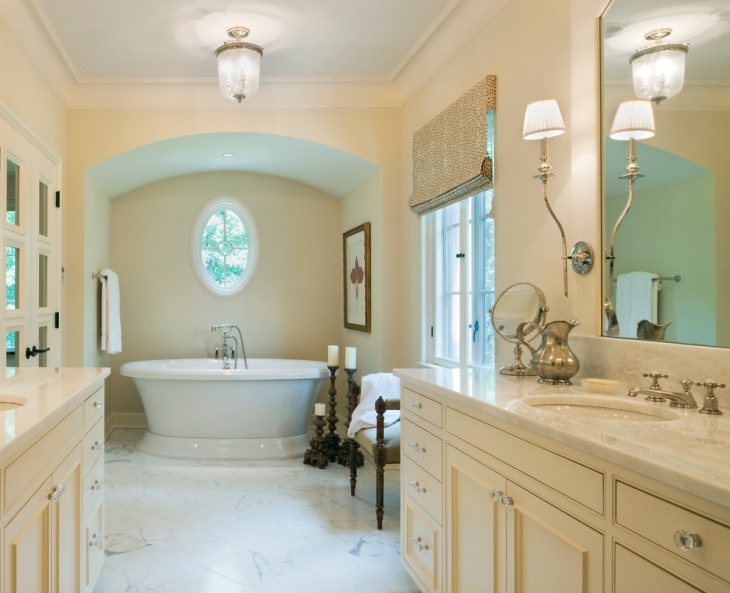 This luxurious French bathroom is designed by keeping in mind the traditional décor. It has a wooden cabinet with standing legs in chocolate brown, and a vintage designed mirror framed in off white. It has a glass enclosed shower area and gray flooring that add to the rustic finish to this bathroom space. 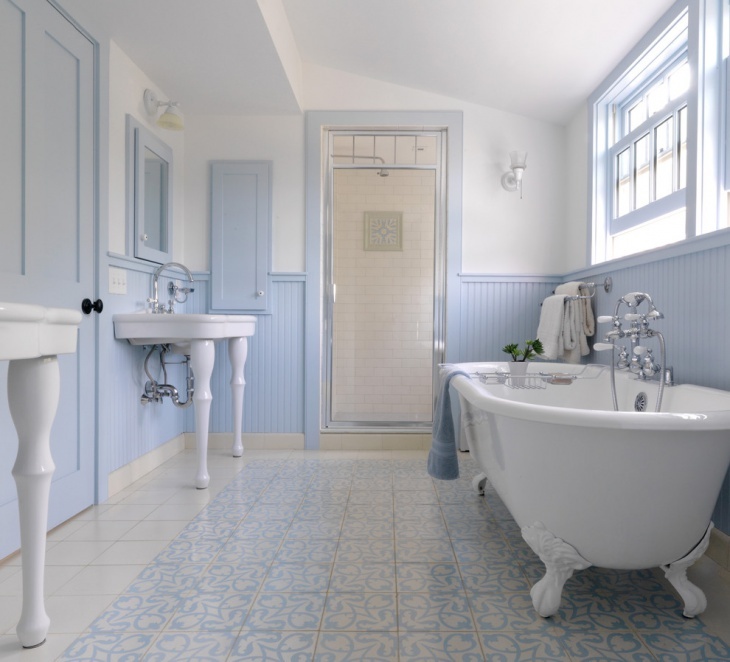 This truly serene and elegant farmhouse bathroom in light blue and white defines sophistication. 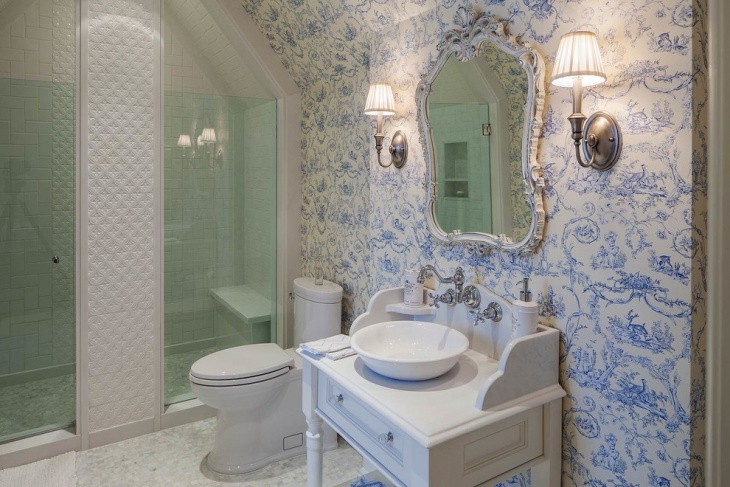 Featuring patterned blue and white tiles, alongside a huge white bathtub with blue walls and doors, it is an ideal French country style bathroom. 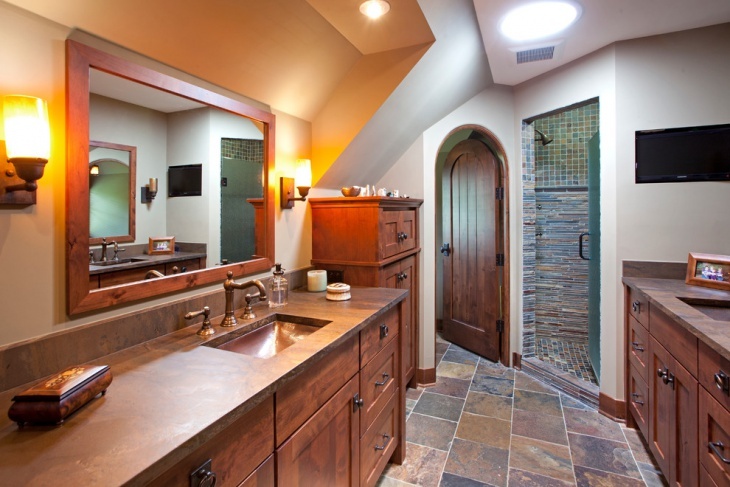 This lovely cottage style bathroom is perfect to be designed inside cottages to keep the bathroom space warm and cozy. It features wooden doors and cabinets alongside natural stone flooring. 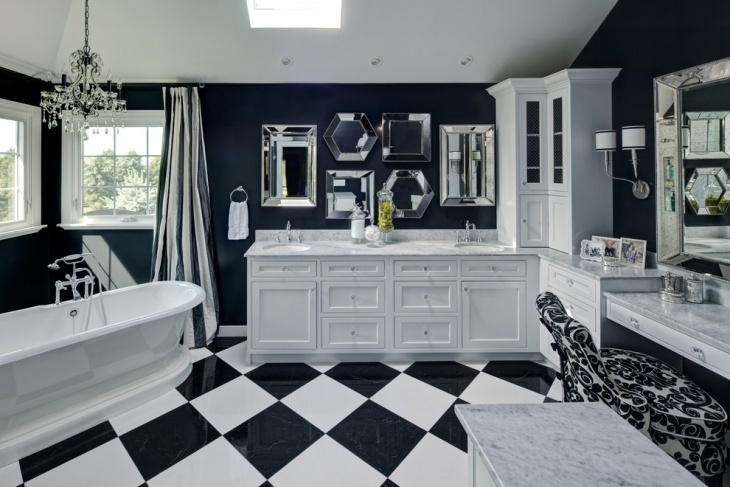 This bathroom is more on the colorful side with various jazzy décor pieces. 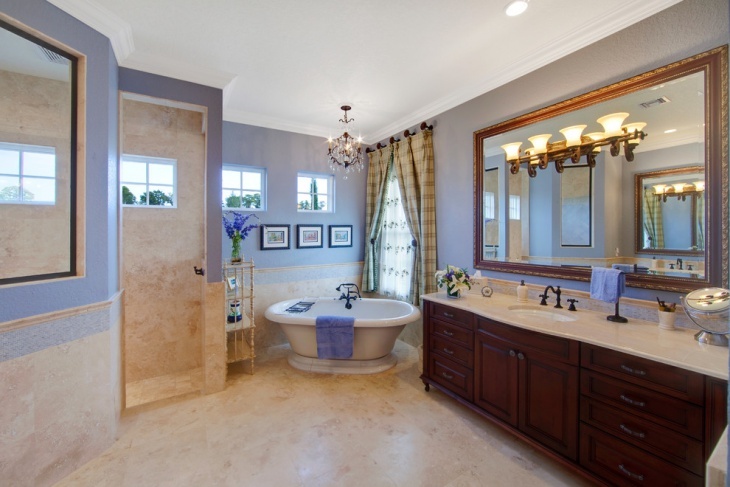 This royal looking bathroom is absolutely gorgeous! 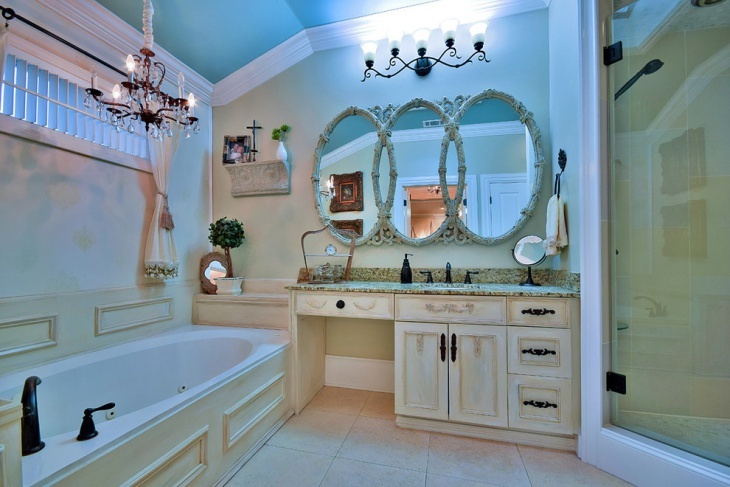 It features a large chandelier with yellowish lights right above the bathtub. The curtains have a fairytale finish to it which is right next to the bathtub. It features white marble flooring, glass enclosed shower area and dual sinks. This all brown bathroom features dark brown wooden vanity alongside black marble countertop with a single sink and faucet. It features a glass-enclosed shower area and has traditional artistic décor all over the bathroom space. This elegant bathroom has patterned white and blue walls with a slope designed ceiling, also featuring white lamp like lights to add to the cozy feeling. It is a small bathroom, hence features a small vanity with a round sink. 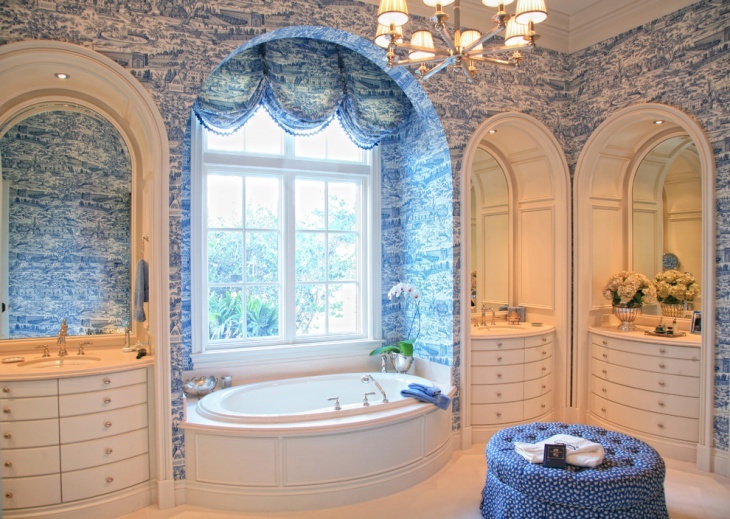 The color scheme of this bathroom space is blue and white. 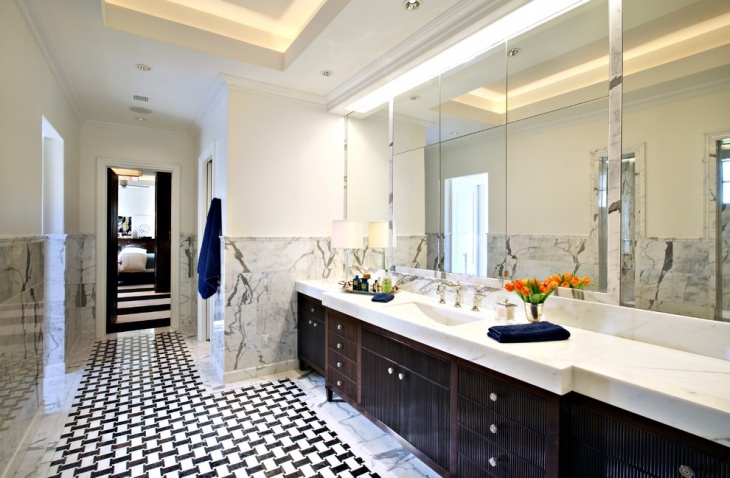 This dark blue and white master bathroom has blue bordered walls on sides of the bathroom. It also contains a large white comfortable arm chair, marble countertops, and modular curtains. The French style country bathrooms have a sophisticated charm to it, even with minimalist décor. You could as well incorporate any of the above designs in your bathroom space to make it look classy and with a pop of elegance. These designs will give you ideas on creating your very own French country bathroom.